What does it take to be an expert injury lawyer? Many lawyers claim to be experts, but very few are. Many lawyers claim to have the experience, know how, savoir fair and the resources to maximize the recovery for your case, but how can you trust these claims? The reason for this topic in my Toronto Injury Law Blog Post this week, is because I was recently retained by 6 new clients whose files were all in the hands of self professed “expert lawyers“, and they were completely unsatisfied by the level of service and results attained to that point in the case. Upon reviewing the file, it was clear to me that limitation periods had been missed, benefits which should have been claimed were ignored, and clients were not getting the medical benefits or medical treatment they so desperately needed. It was clear to me, and to the lawyers at my law firm that these “self-claimed experts” did not know what they were doing. It was as if it was the first time they had handled a personal injury case in Ontario. I couldn’t believe my eyes. I felt shock, anger, and sympathy for my clients all at the same time. You try that. It’s a whirlwind of emotion. Many of you will want to know who these lawyers or law firms are. For the sake of staying out of trouble, I cannot say. But, what I can tell you is that spending millions on marketing does not make you an expert; nor does dabbling in other areas of the law. My law firm only practices in the field of accident law on behalf of injured people in Ontario. We don’t dabble in real estate, family, tax, or criminal law. Many of the files which we inherited came from “dabblers” of accident law, which is never a good sign. I always tell people that if you need heart surgery, do you go to a doctor who does heart surgery on the side, or do you find a proper heart surgeon? Do you find a doctor who practices heart surgery part time, or do you find the brigthest and the best heart surgeon around? The same analogy applies to finding a good personal injury lawyer. I will let you in on a little secret. Our law firm recieves countless calls per day from accident victims, family members, their loved ones and disability claimants from across our great province. Of all of those phone calls we recieve, only a select few become clients of our law firm. We are selective in terms of the cases which we take on, and the people who we call our clients. There are very good reasons for that. The changes to the laws for recovery for any amount of money for pain and suffering, or for accident benefits in Ontario have made it very difficult to recover compensation since September 1, 2010. If we recieved the same calls in the 1970’s, it would be a completely different ball game. Those were the days which are referred to by some as the “auto lotto“, whereby accident victims could recover monetary awards even for the smallest injury and the smallest accident. There was no $30,000 deductible for pain and suffering claims. There was no threshold for injuries to meet. Injuries did not have to be a serious and permanent impairment of an important bodily function. Essentially, you could be hurt for a day or two, and then get better, and still get compensation for your injuries. Those days are long gone. Now, with the application of the $30,000 deductible for pain and suffering claims, plaintiff lawyers need to be more careful of the cases which they take on. Imagine that your lawyer handles your file for 5 years, and does a 2 week jury trial in a Toronto Court House. That lawyer spends $40,000 on expert reports, engineering reports, medical records, and other out of pocket expenses. After the 2 week trial, the Judge and Jury award you $40,000 for your pain and suffering. But, after the application of the $30,000 deductible, that $40,000 award is really only $10,000! The lawyer will have to take a big hit on his legal fees because the award does not even cover his disbursements. This is why our office is very careful about the people with whom we meet and the cases we take on. While no question is a bad question to ask, not everyone has a case given how the laws for car accidents work in the 21st century. It should be noted that this week is the International Skating Union World Championships in London ON. . The ISU Championship is taking place at the Budweiser Gardens (formerly the John Labatt Centre), which is a block away from Goldfinger Law’s London office at 341 Talbot Street. If you follow @GoldfingerLaw on Twitter, you will notice that Brian took some great pics of the preparation work done downtown in preparation for the championships. I can tell you that the downtown London core is looking beautiful, but it’s packed with tourists and skating fans attending at the competition. There’s no parking, and it’s very busy. Accordingly, our London office will be closed this week for the games. All appointments have been cancelled, except for home and hospital visits which will go on as scheduled. So, if you’re planning on dropping by the office to drop something off, or say “hi“, we will be closed on account of the ISU Worlds 2013. If you need to reach us, call us local at 519-601-3277, toll free at 1-877-730-1777 or drop us an email at info@goldfingerlaw.com. We will get back to you within 24 hours at the very latest. We will re-open next week when the championships have completed. You’ll be glad, as downtown is a zoo (but a beautiful zoo at that). London has done a great job rolling out the red carpet for all the skaters, dignitaries and guests. Well done! 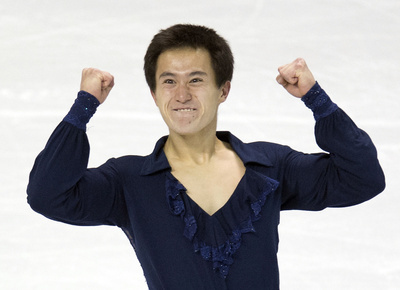 Anyone see Patrick Chan’s short performance last night? He broke a world record. Amazing to see in the Forest City.